Rediscovering works of art that have been overlooked by previous generations is one of the most exciting and gratifying aspects of art historical research. This is especially true for studies about Japan, a culture whose artistic output - although having come into fashion in the West initially during the second half of the 19th century - has only recently been fully accepted by the majority of scholars as an equal field of scientific research. Consequently, while most remarkable art in Europe and North America during the following 20th century has been acknowledged in the form of papers, books, conferences or exhibitions, the former "outsiders" of the by now obsolete orthodox Eurocentric art history still hold a rich body of yet to be appreciated artworks that likewise ought to be given their rightful place amongst those already accepted in the canon of today's international art history. In order to call more attention to one of those artists largely neglected only until recently, Hashimoto Shōkō's (b. 1939 in Ishinomaki, Miyagi Prefecture) debut photobook Goze, first published in 1974, will be reviewed here as the second installment of Faraway Eyes' series on publications distributed by the Japanese publishing house Nora-Sha. The decision to include Hashimoto's work was certainly not made simply for the sake of completeness but because of the photographer's interesting choice to combine a rather radical visual style of photography with a subject-matter that was in contrast highly traditional. 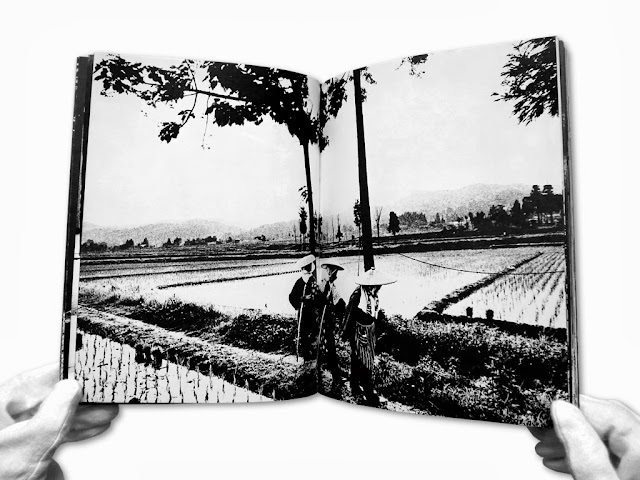 As previously mentioned in the introduction to the review of Miyadera Saburō's book Roji (1979), the following notes should be regarded as interim conclusions to a photographer's work that requires further research. After studying photography at the Nippon University's Fine Arts Department Hashimoto started working as a freelance photographer in 1964. 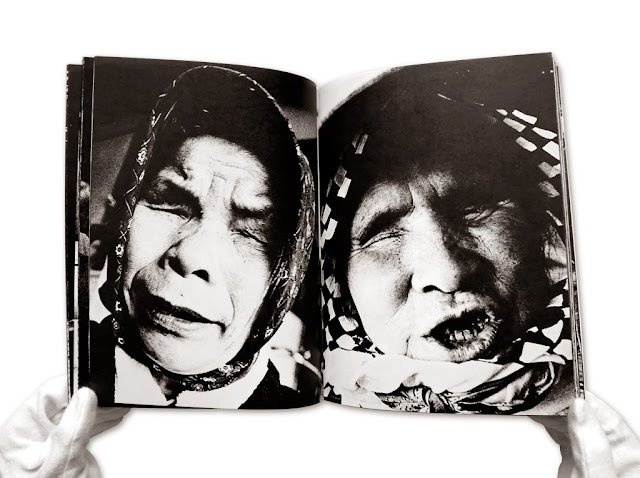 His primal engagement would become the portrayal of the few remaining Goze still living in Niigata Prefecture, which he photographed repeatedly as of 1969. The term Goze, literally meaning blind woman, describes visually impaired women who, since the beginning of the Edo Period (1603-1867), had been living together in small ascetic organizations characterized by austere discipline and a clear hierarchic structure similar to that of a convent. The women lived separated from their family members from an early age and were trained by a teacher in several arts such as singing traditional songs and playing the shamisen. The long lasting training would eventually enable the students to become a Goze and join their group's periodical travels across the rural areas of northern Japan as itinerant musicians who collected alms in form of rice; one of the few respectable ways of earning a living as a handicapped person at that time. 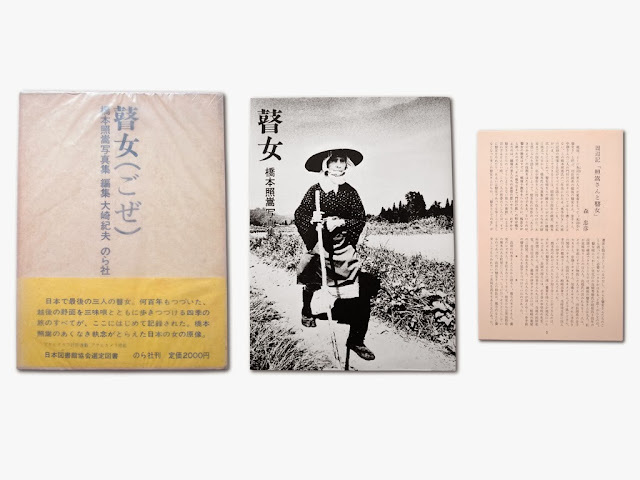 Hashimoto, who took most of the photographs included in Goze between 1972 and 1974, was regularly joined on his travels by the magazine writer Mori Tadahiko who contributed an accompanying text which is enclosed in the book as a small eight-page brochure. The text serves as an easy to understand introduction to the specific subject-matter as well as a good overview of the trips he took together with Hashimoto. The photographer himself also kept a detailed diary that is reproduced on the last ten pages of the book. Unlike most photographers who, as Mark Pearson pointed out, were often rejected in their efforts to document the last survivors of this dying trade, Hashimoto and Mori managed to develop close relationships to the members of two Goze groups who had been living in Takada and Nagaoka. Mori illustrated the nature of their mutual respect by noting that the teacher of the Takada group still recognized him only by the sound of his voice after three years of absence or that she had kept a little bell that Hashimoto had given to her as a gift on a previous visit. The considerable time and effort Hashimoto spent in order to photograph the Goze allowed him to capture their lives as it was linked to the four seasons. Consequently, the slipcased book is divided into four chapters starting at winter time. But in spite of all efforts and devotion to his subject the publication should not be mistaken for an absolute accurate portrayal of the lifestyle of the Goze since they had in fact already been retired by the time Hashimoto came to photograph them in the early 1970s. Nonetheless, Mori wrote that at least to them rare sights such as the Goze of Takada, as they crouched one day side by side on the tatami floor listening to their teacher's singing, was undoubtedly real. Last but not least it should be said that the grainy high contrast reproduction quality of the black-and-white images at first sight resembles that of photographs directly associated with the Provoke group. Interestingly enough, Hashimoto was in fact a close friend of one of the founding members, Nakahira Takuma (1938-2015). To what degree this friendship might have actually given Hashimoto an impetus to pursue the particular visual style seen in Goze is however uncertain. Considering that in particular Nakahira and Moriyama around that time had been striving for maximum anonymity in their photography while simultaneously trying to push the medium beyond its mediative capabilities, it seems rather unlikely that Hashimoto's folklore work was greatly inspired by the Provoke spirit. 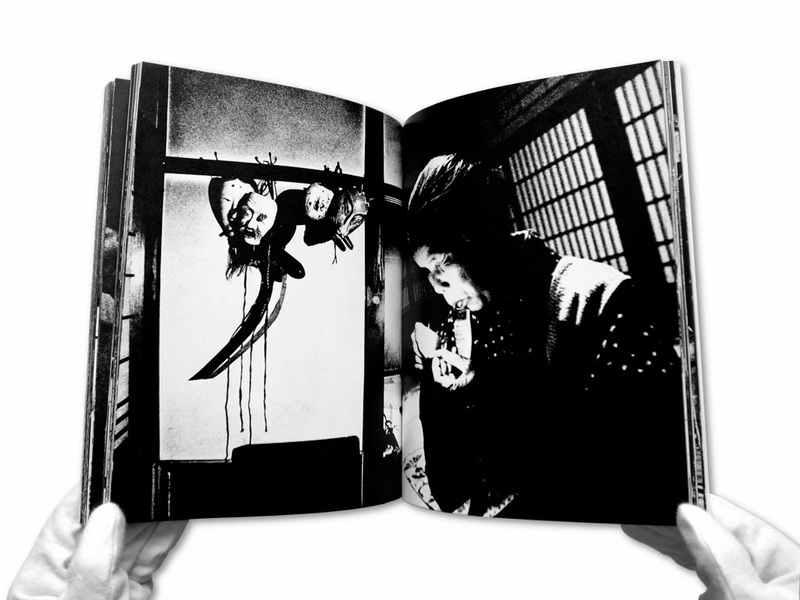 It is nevertheless safe to say that the gritty grain texture of Hashimoto's photographs serves the book's subject matter very well. It underlines the archaic visual appearance of the Goze and helps to visualize the asperity of Japan's northern countryside; a region that is well known for its harsh cold climate and deep-rooted folk beliefs.